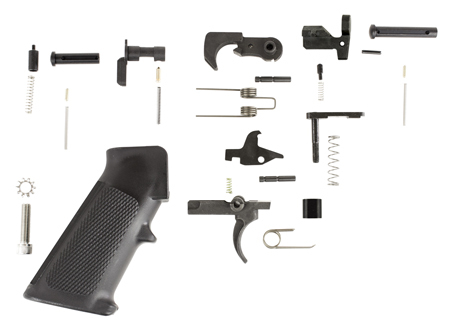 This lower parts kit helps you to build a custom .308 AR from the ground up. It features Milspec dimensions and coating ensure the highest quality and correct component interface. The kit includes Takedownpivot Spring Takedownpivot detent Triggerhammer pin M5 308 Takedown and pivot pin M5 308 bolt catchspring buffer and roll pin safety selectorspring and detent buffer retainer and spring trigger guard and roll pin A2 pistol gripscrew and lock washer hammer and disconnector spring magazine catch bodyspring and button hammer trigger and a disconnector.